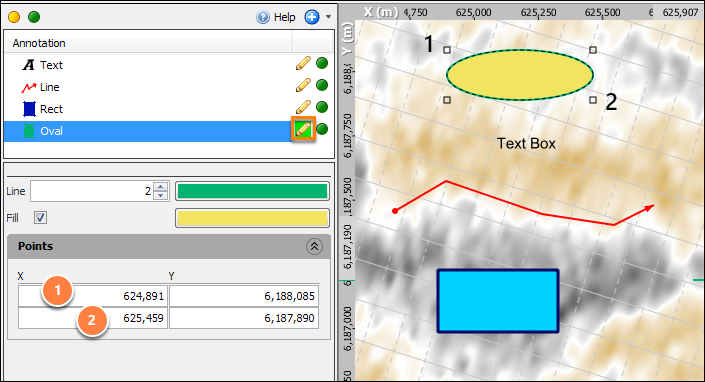 In addition to the preset annotations available in the Annotations tab of the Map View (i.e. north arrow, scale bar, colour bars), custom annotations can also be created. Note: Lines and rectangular annotations can be exported as culture files (see Export straight-line annotations below). In the Map View, open the Draw tab from the left panel. Click the Add icon and choose the type of annotation to create. A new annotation will be created in the Annotation tree. It can be renamed by double clicking the item in the tree. Click the Add icon and select New text box to create a custom text box. The Pick Annotation pencil icon will automatically be enabled. Click anywhere in the map to insert a text box. Double click or press Esc to disable picking mode. In the Details Panel of the text box, type the text in the Text field. At Font, choose the font and font size of the text. At Style, choose the emphasis to put on the text (i.e. bold, italics) and pick a font colour by clicking on the adjacent colourbar. Define the Alignment of the text inside the text box. Select the Background checkbox and pick a colour from the colourbar to fill the check box with colour. To move the text box to another location, click the Pick Annotation pencil icon and drag the box in the viewer. Alternatively, right click the text in the map view and select Pick Text. A third option is to change the X and Y points in the Points section of the Details Panel. Tip: For more colour options, click on the button ( >> ) at the bottom of the colour popup box to open the Select Colour window. You can also adjust the Opacity by moving the slider on the right. Click the Add icon and select New line to draw a custom line. The Pick Annotation pencil icon will automatically be enabled. Click anywhere in the map to pick the points in the line. If you make a mistake, right click on a point to remove it. In the Details Panel of the line, define the thickness and colour of the line. At Begin style, choose the type of icon to represent the first point. At End style, choose the type of icon to represent the last point. To move the points of the line to another location, click the Pick Annotation pencil icon, click on the point and click on a new location. Alternatively, right click the line in the map view and select Pick Line. A third option is to change the X and Y points in the Points section of the Details Panel. Click the Add icon and select New rectangle to draw a custom rectangle. The Pick Annotation pencil icon will automatically be enabled. Click anywhere in the map to pick the points. Only two points are needed to define the rectangle. In the Details Panel of the rectangle, define the thickness and colour of the rectangle's border. Select the Fill check box and pick a colour from the adjacent colour bar to fill the rectangle with the desired colour. To move the points of the rectangle to another location, click the Pick Annotation pencil icon, click on the point and click on a new location. Alternatively, right click the rectangle in the map view and select Pick Rect. A third option is to change the X and Y points in the Points section of the Details Panel. Tip: For more colour options, click on the button ( > > ) at the bottom of the colour popup box to open the Select Colour window. You can also adjust the Opacity by moving the slider on the right. Click the Add icon and select New oval to draw a custom oval. The Pick Annotation pencil icon will automatically be enabled. Click anywhere in the map to pick the points. Only two points are needed to define the oval. In the Details Panel of the oval, define the thickness and colour of the oval's border. Select the Fill check box and pick a colour from the adjacent colour bar to fill the oval with the desired colour. To move the points of the oval to another location, click the Pick Annotation pencil icon, click on the point and click on a new location. Alternatively, right click the oval in the map view and select Pick Oval. A third option is to change the X and Y points in the Points section of the Details Panel. Hand-drawn Line and Rectangle annotations can be exported as culture files (.duculture format). 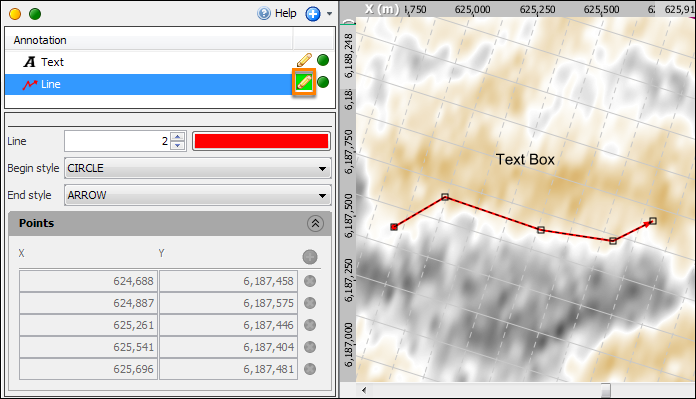 Right click on the annotation in the Draw tab and select Export 'Annotation'. 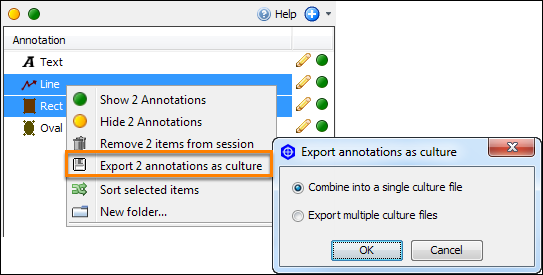 Multiple annotations can be exported at the same time into a single .duculture file or into multiple .duculture files. Type a name for the culture file and browse to your desired saved location. Note: The Export option is only visible if a compatible annotation type is selected (line or rectangle). Once exported, the culture files can be imported into Insight (see How do I import a Culture file? ).